The third annual Gulfport Harbor Lights Winterfest is soon to begin at Gulfport Mississippi Resorts. To enjoy the holiday season to its fullest, friends and family may stay with Biloxi Beach Resort Rentals to enjoy all the winter season has to offer in Southern Mississippi. Visit Santa's village on a walking tour or, if you would be more comfortable, aboard a heated trolley. Brilliant light displays, photo opportunities at Elfie Selfie stations, and seasonal treats of hot chocolate and marshmallows all await yuletide visitors. The Christmas Market, located in Jones Park along Highway 90, offers shoppers unique gifts handcrafted by local artisans. Additionally, tickets will be available for fun riders such as Santa's Big Wheel, the Merry Go Round, and more. To make a visit to the Market as enjoyable and easy as possible, tickets can be purchased while in the park or at the CTA Parking Garage. From the garage, guests may use the park and pay option, which includes parking, shuttle service and show entry. When celebrating this merriest time of the year, Biloxi Beach Resort Rentals brings together family and friends, both old and new, along with visitors and guests for a truly memorable and magical holiday celebration of lights, food, and fun. 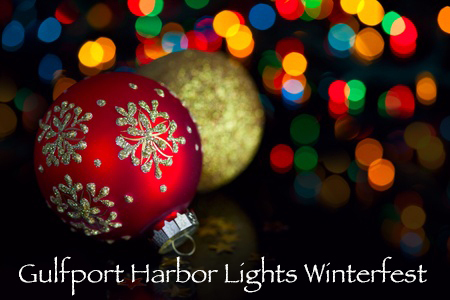 Embrace the spirit of the season in Southern Mississippi by visiting the Gulfport Harbor Lights Winterfest, open nightly from 5:30 PM to 9:30 PM November 25th to January 1st at Jones Parkway off of Highway 90. Enjoy one of the country's leading holiday light shows and make unforgettable memories with loved ones.